Our Engraved Money Clip makes the perfect gift for any husband, father, or even grandfather. It is personalized with any name. This is an easy way to carry money around anywhere you may need to go. Our Engraved Silver Money Clip measures 2-1/2"L x 1/2W and is a perfect gift for the groomsman in your wedding. The money clip is non-tarnishing and features premium quality nickel plating for optimal luster and durability. Engraved gifts include FREE personalization! 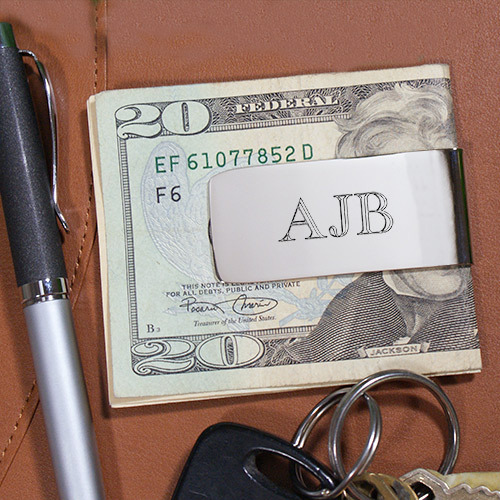 Engrave your Money Clip with any 3 initials or name. See volume pricing below to make cheaper groomsmen gift ideas. Engraved money clip also makes a unique Father's Day gift idea. Shipped fast and product received with no problems. Additional Details Engraved Gifts make excellent personalized Father's Day Gift ideas!